x86 memory segmentation refers to the implementation of memory segmentation in the Intel x86 computer instruction set architecture. Segmentation was introduced on the Intel 8086 in 1978 as a way to allow programs to address more than 64 KB (65,536 bytes) of memory. The Intel 80286 introduced a second version of segmentation in 1982 that added support for virtual memory and memory protection. At this point the original model was renamed real mode, and the new version was named protected mode. The x86-64 architecture, introduced in 2003, has largely dropped support for segmentation in 64-bit mode. In both real and protected modes, the system uses 16-bit segment registers to derive the actual memory address. In real mode, the registers CS, DS, SS, and ES point to the currently used program code segment (CS), the current data segment (DS), the current stack segment (SS), and one extra segment determined by the programmer (ES). The Intel 80386, introduced in 1985, adds two additional segment registers, FS and GS, with no specific uses defined by the hardware. The way in which the segment registers are used differs between the two modes. The choice of segment is normally defaulted by the processor according to the function being executed. Instructions are always fetched from the code segment. Any stack push or pop or any data reference referring to the stack uses the stack segment. All other references to data use the data segment. The extra segment is the default destination for string operations (for example MOVS or CMPS). FS and GS have no hardware-assigned uses. The instruction format allows an optional segment prefix byte which can be used to override the default segment for selected instructions if desired. Three segments in real mode memory (click on image to enlarge). There is an overlap between segment 2 and segment 3; the bytes in the turquoise area can be used from both segment selectors. In real mode or V86 mode, the size of a segment can range from 1 byte up to 65,536 bytes (using 16-bit offsets). The 16-bit segment selector in the segment register is interpreted as the most significant 16 bits of a linear 20-bit address, called a segment address, of which the remaining four least significant bits are all zeros. The segment address is always added to a 16-bit offset in the instruction to yield a linear address, which is the same as physical address in this mode. For instance, the segmented address 06EFh:1234h (here the suffix "h" means hexadecimal) has a segment selector of 06EFh, representing a segment address of 06EF0h, to which the offset is added, yielding the linear address 06EF0h + 1234h = 08124h. Because of the way the segment address and offset are added, a single linear address can be mapped to up to 212 = 4096 distinct segment:offset pairs. For example, the linear address 08124h can have the segmented addresses 06EFh:1234h, 0812h:0004h, 0000h:8124h, etc. This could be confusing to programmers accustomed to unique addressing schemes, but it can also be used to advantage, for example when addressing multiple nested data structures. While real mode segments are always 64 KB long, the practical effect is only that no segment can be longer than 64 KB, rather than that every segment must be 64 KB long. Because there is no protection or privilege limitation in real mode, even if a segment could be defined to be smaller than 64 KB, it would still be entirely up to the programs to coordinate and keep within the bounds of their segments, as any program can always access any memory (since it can arbitrarily set segment selectors to change segment addresses with absolutely no supervision). Therefore, real mode can just as well be imagined as having a variable length for each segment, in the range 1 to 65,536 bytes, that is just not enforced by the CPU. Each segment begins at a multiple of 16 bytes, called a paragraph, from the beginning of the linear (flat) address space. That is, at 16 byte intervals. Since all segments are 64 KB long, this explains how overlap can occur between segments and why any location in the linear memory address space can be accessed with many segment:offset pairs. The actual location of the beginning of a segment in the linear address space can be calculated with segment×16. A segment value of 0Ch (12) would give a linear address at C0h (192) in the linear address space. The address offset can then be added to this number. 0Ch:0Fh (12:15) would be C0h+0Fh=CFh (192+15=207), CFh (207) being the linear address. Such address translations are carried out by the segmentation unit of the CPU. The last segment, FFFFh (65535), begins at linear address FFFF0h (1048560), 16 bytes before the end of the 20 bit address space, and thus, can access, with an offset of up to 65,536 bytes, up to 65,520 (65536−16) bytes past the end of the 20 bit 8088 address space. On the 8088, these address accesses were wrapped around to the beginning of the address space such that 65535:16 would access address 0 and 65533:1000 would access address 952 of the linear address space. Programmers using this feature led to the Gate A20 compatibility issues in later CPU generations, where the linear address space was expanded past 20 bits. In 16-bit real mode, enabling applications to make use of multiple memory segments (in order to access more memory than available in any one 64K-segment) is quite complex, but was viewed as a necessary evil for all but the smallest tools (which could do with less memory). The root of the problem is that no appropriate address-arithmetic instructions suitable for flat addressing of the entire memory range are available. Flat addressing is possible by applying multiple instructions, which however leads to slower programs. The memory model concept derives from the setup of the segment registers. For example, in the tiny model CS=DS=SS, that is the program's code, data, and stack are all contained within a single 64 KB segment. In the small memory model DS=SS, so both data and stack reside in the same segment; CS points to a different code segment of up to 64 KB. 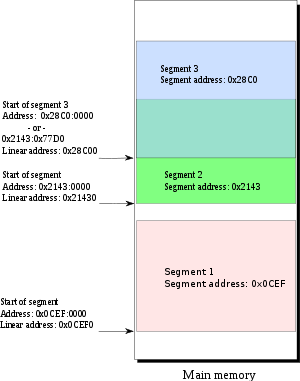 Three segments in protected mode memory (click on image to enlarge), with the local descriptor table. The 80286's protected mode extends the processor's address space to 224 bytes (16 megabytes), but not by adjusting the shift value. Instead, the 16-bit segment registers now contain an index into a table of segment descriptors containing 24-bit base addresses to which the offset is added. To support old software, the processor starts up in "real mode", a mode in which it uses the segmented addressing model of the 8086. There is a small difference though: the resulting physical address is no longer truncated to 20 bits, so real mode pointers (but not 8086 pointers) can now refer to addresses between 10000016 and 10FFEF16. This roughly 64-kilobyte region of memory was known as the High Memory Area (HMA), and later versions of MS-DOS could use it to increase the available "conventional" memory (i.e. within the first MB). With the addition of the HMA, the total address space is approximately 1.06 MB. Though the 80286 does not truncate real-mode addresses to 20 bits, a system containing an 80286 can do so with hardware external to the processor, by gating off the 21st address line, the A20 line. The IBM PC AT provided the hardware to do this (for full backward compatibility with software for the original IBM PC and PC/XT models), and so all subsequent "AT-class" PC clones did as well. 286 protected mode was seldom used as it would have excluded the large body of users with 8086/88 machines. Moreover, it still necessitated dividing memory into 64k segments like was done in real mode. This limitation can be worked around on 32-bit CPUs which permit the use of memory pointers greater than 64k in size, however as the Segment Limit field is only 24-bit long, the maximum segment size that can be created is 16MB (although paging can be used to allocate more memory, no individual segment may exceed 16MB). This method was commonly used on Windows 3.x applications to produce a flat memory space, although as the OS itself was still 16-bit, API calls could not be made with 32-bit instructions. Thus, it was still necessary to place all code that performs API calls in 64k segments. Once 286 protected mode is invoked, it could not be exited except by performing a hardware reset. Machines following the rising IBM PC/AT standard could feign a reset to the CPU via the standardised keyboard controller, but this was significantly sluggish. Windows 3.x worked around both of these problems by intentionally triggering a triple fault in the interrupt-handling mechanisms of the CPU, which would cause the CPU to drop back into real mode, nearly instantly. A logical address consists of a 16-bit segment selector (supplying 13+1 address bits) and a 16-bit offset. The segment selector must be located in one of the segment registers. That selector consists of a 2-bit Requested Privilege Level (RPL), a 1-bit Table Indicator (TI), and a 13-bit index. where CPL is the current privilege level (found in the lower 2 bits of the CS register), RPL is the requested privilege level from the segment selector, and DPL is the descriptor privilege level of the segment (found in the descriptor). All privilege levels are integers in the range 0–3, where the lowest number corresponds to the highest privilege. If the inequality is false, the processor generates a general protection (GP) fault. Otherwise, address translation continues. The processor then takes the 32-bit or 16-bit offset and compares it against the segment limit specified in the segment descriptor. If it is larger, a GP fault is generated. Otherwise, the processor adds the 24-bit segment base, specified in descriptor, to the offset, creating a linear physical address. The privilege check is done only when the segment register is loaded, because segment descriptors are cached in hidden parts of the segment registers. In the Intel 80386 and later, protected mode retains the segmentation mechanism of 80286 protected mode, but a paging unit has been added as a second layer of address translation between the segmentation unit and the physical bus. Also, importantly, address offsets are 32-bit (instead of 16-bit), and the segment base in each segment descriptor is also 32-bit (instead of 24-bit). The general operation of the segmentation unit is otherwise unchanged. The paging unit may be enabled or disabled; if disabled, operation is the same as on the 80286. If the paging unit is enabled, addresses in a segment are now virtual addresses, rather than physical addresses as they were on the 80286. That is, the segment starting address, the offset, and the final 32-bit address the segmentation unit derived by adding the two are all virtual (or logical) addresses when the paging unit is enabled. When the segmentation unit generates and validates these 32-bit virtual addresses, the enabled paging unit finally translates these virtual addresses into physical addresses. The physical addresses are 32-bit on the 386, but can be larger on newer processors which support Physical Address Extension. The 80386 also introduced two new general-purpose data segment registers, FS and GS, to the original set of four segment registers (CS, DS, ES, and SS). Unlike 286 protected mode, 386 CPUs can be put back into real mode merely by clearing a bit in the CR0 control register. The x86-64 architecture does not use segmentation in long mode (64-bit mode). Four of the segment registers: CS, SS, DS, and ES are forced to 0, and the limit to 264. The segment registers FS and GS can still have a nonzero base address. This allows operating systems to use these segments for special purposes. Unlike the global descriptor table mechanism used by legacy modes, the base address of these segments is stored in a model-specific register. The x86-64 architecture further provides the special SWAPGS instruction, which allows swapping the kernel mode and user mode base addresses. For instance, Microsoft Windows on x86-64 uses the GS segment to point to the Thread Environment Block, a small data structure for each thread, which contains information about exception handling, thread-local variables, and other per-thread state. Similarly, the Linux kernel uses the GS segment to store per-CPU data. On x64, the CPU powers on into real mode and is indistinguishable from a 32-bit Pentium 4. 64-bit instructions cannot be used unless long mode is set. When long mode is operating, 16-bit instructions and virtual x86 mode are disabled and protected mode disappears. GS/FS are also used in gcc's thread-local storage and canary-based stack protector. However, segment registers are usually used implicitly. All CPU instructions are implicitly fetched from the code segment specified by the segment selector held in the CS register. Most memory references come from the data segment specified by the segment selector held in the DS register. These may also come from the extra segment specified by the segment selector held in the ES register, if a segment-override prefix precedes the instruction that makes the memory reference. Most, but not all, instructions that use DS by default will accept an ES override prefix. Processor stack references, either implicitly (e.g. push and pop instructions) or explicitly (memory accesses using the (E)SP or (E)BP registers) use the stack segment specified by the segment selector held in the SS register. String instructions (e.g. stos, movs), along with data segment, also use the extra segment specified by the segment selector held in the ES register. Current Linux also uses GS to point to thread-local storage. Segments can be defined to be either code, data, or system segments. Additional permission bits are present to make segments read only, read/write, execute, etc. In protected mode, code may always modify all segment registers except CS (the code segment selector). This is because the current privilege level (CPL) of the processor is stored in the lower 2 bits of the CS register. The only ways to raise the processor privilege level (and reload CS) are through the lcall (far call) and int (interrupt) instructions. Similarly, the only ways to lower the privilege level (and reload CS) are through lret (far return) and iret (interrupt return) instructions. In real mode, code may also modify the CS register by making a far jump (or using an undocumented POP CS instruction on the 8086 or 8088)). Of course, in real mode, there are no privilege levels; all programs have absolute unchecked access to all of memory and all CPU instructions. For more information about segmentation, see the IA-32 manuals freely available on the AMD or Intel websites. ^ a b "Intel 64 and IA-32 Architectures Software Developer's Manual", Volume 3, "System Programming Guide", published in 2011, Page "Vol. 3A 3-11", the book is written: "Every segment register has a “visible” part and a “hidden” part. 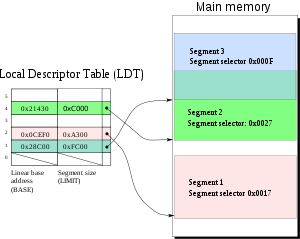 (The hidden part is sometimes referred to as a “descriptor cache” or a “shadow register.”) When a segment selector is loaded into the visible part of a segment register, the processor also loads the hidden part of the segment register with the base address, segment limit, and access control information from the segment descriptor pointed to by the segment selector. The information cached in the segment register (visible and hidden) allows the processor to translate addresses without taking extra bus cycles to read the base address and limit from the segment descriptor." ^ Intel Corporation (2004). IA-32 Intel Architecture Software Developer's Manual Volume 1: Basic Architecture (PDF). ^ POP CS must be used with extreme care and has limited usefulness, because it immediately changes the effective address that will be computed from the instruction pointer to fetch the next instruction. Generally, a far jump is much more useful. The existence of POP CS is probably an accident, as it follows a pattern of PUSH and POP instruction opcodes for the four segment registers on the 8086 and 8088.